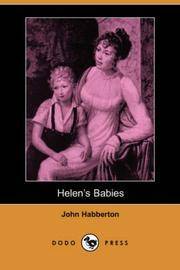 Helen's Babies (Dodo Press): From A Body Of Fictional Works All Set In 19Th Century California, From A Former Literary And Drama Critic For The 'New York Herald'. Dodo Press. Paperback. GOOD. Spine creases, wear to binding and pages from reading. May contain limited notes, underlining or highlighting that does affect the text. Possible ex library copy, thatâll have the markings and stickers associated from the library. Accessories such as CD, codes, toys, may not be included. Dodo Press, 2007-01-31. Paperback. Good. Dodo Press. PAPERBACK. 1406515531 Special order direct from the distributor . New. Dodo Press, 2007-01-31. Paperback. Used:Good. 2007-01-31. Good. Ships with Tracking Number! INTERNATIONAL WORLDWIDE Shipping available. May not contain Access Codes or Supplements. May be ex-library. Shipping & Handling by region. Buy with confidence, excellent customer service! 2007-01-31. New. Ships with Tracking Number! INTERNATIONAL WORLDWIDE Shipping available. Buy with confidence, excellent customer service!